Mix together "soy" sauce, sesame oil, sugar, salt, and water; taste and adjust as you like. If using a chicken breast, butterfly it. Marinate fillets for 15 minutes (if using some chicken and some salmon, marinate separately). 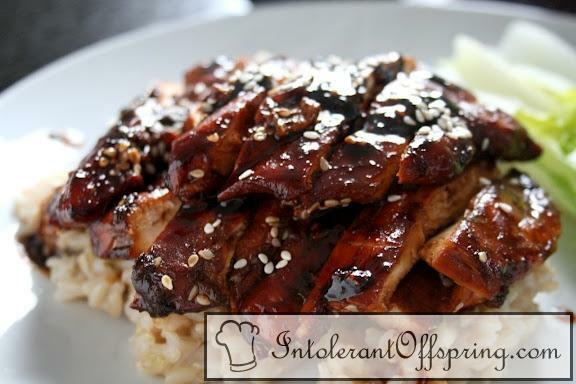 Grill the meat in a skillet, including about 1/3 of the sauce as well as a few sprinkles of sesame seeds. Put meat over brown rice. Boil the remaining sauce, reduce heat, and cook for about 5 minutes to thicken up. Pour the sauce over the meat and rice. Sprinkle with sesame seeds.